Since 2006, Maximus Clarke, in conjunction with Chris Ianuzzi, has produced and curated SPLICE, a live electronic music and multimedia performance series in New York City. SPLICE events are artist-centric: designed to support emerging talent, make connections across scenes and genres, and bring new electronic art to wider public attention. 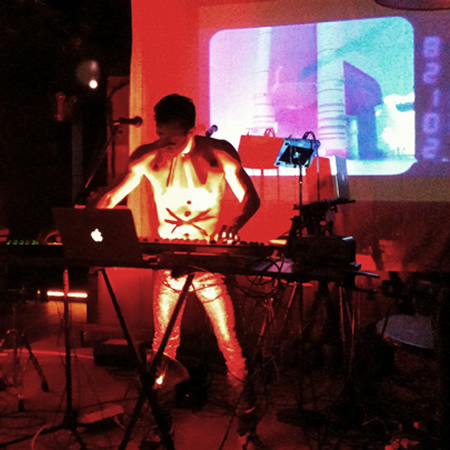 Under the banner of “eclectic electronics”, SPLICE has presented a wide range of music, from electropop to experimental, by artists using techniques and technologies including analog, digital, and acoustic instruments, vocals, noise, audio and video collage, performance art, circuit-bending, sonification, and more. SPLICE has featured performers from New York City and across the U.S., as well as Canada, Peru, Germany, Italy, Japan, Korea, and Australia. SPLICE also showcases many visualists, filmmakers, DJs, and interactive technology artists. In 2012, the Popular Front Systems label released SPLICEWERK, a compilation of audio collaborations by artists who have performed at SPLICE. Each track is a co-production, remix, or mashup by 2 or more SPLICE veterans.